Formulation: Liquid. In 10mM TRIS, pH 7.5, containing 100mM NaCl, 3mM MgCl2 and 10% glycerol. Biological Activity: Like other class I HDACs, HDAC8 exhibits trichostatin A-inhibitable histone deacetylase activity and can mediate transcription repression. Specific Activity: ≥0.4 U/µg. One unit is defined as the amount of enzyme that deacetylates 1pmol/min of FLUOR DE LYS®-SIRT1 deacetylase substrate (Prod. No. BML-KI177) at 37°C / 500µM. Application Notes: Useful tool to study HDAC8 kinetics and inhibitor sensitivity and also the effect of the enzyme in transcriptional regulation, cell cycle progression, and oncogenesis. Use/Stability: The enzyme is stable on ice for the time typically required to set up an experiment (30-60 min. ), but may lose activity with dilution and/or prolonged storage on ice. It is recommended that thawing and addition of the enzyme to assay wells be done within as short a time as possible before start of the assay and that the thawed enzyme be kept on ice throughout. Best results will be obtained by adding the chilled, undiluted enzyme directly to prewarmed buffer and proceeding immediately to the addition of pre-warmed substrate. Either add a small volume of undiluted enzyme to each well (e.g. 1 U per well) or dilute into pre-warmed buffer (e.g. 1 U per 25 μl) and immediately aliquot to wells (see attached assay conditions). The remaining, unused enzyme should be refrozen quickly by, for example, snap freezing in a dry/ice ethanol bath or liquid nitrogen. The enzyme is stable to at least 4 freeze/thaw cycles. To minimize the number of freeze/thaw cycles, aliquot the HDAC8 into separate tubes and store at -70°C. NOTE: When stored under the above conditions, this enzyme is stable at the concentration supplied, in its current storage buffer. Procedures such as dilution of the enzyme followed by refreezing, could lead to loss of activity. HDAC8 (Prod. No. BML-SE145): Supplied at 0.5-1.0 U/μl. Best results will be obtained by adding the chilled, undiluted enzyme directly to pre-warmed buffer and proceeding immediately to the addition of pre-warmed substrate. Either add a small volume of undiluted enzyme to each well (e.g. 1 U per well) or dilute into pre-warmed buffer (e.g. 1 U per 25 μl) and immediately aliquot to wells. Note that since the assay described on the next page under “Reaction Conditions” involves just a few wells, the procedure employs the former option, the addition of undiluted enzyme to each well. NOTE: HDAC8 Activity units are defined by assay with 250 μM FLUOR DE LYS® Substrate (BML-KI104). The alternative substrate, FLUOR DE LYS®-HDAC8 (Prod. No. BML-KI178) is, however, ~10-fold more efficient and conditions are given here for assay at 100 μM. Dilute 50 mM BML-KI104 stock in DMSO to 500 μM or 5 mM BML-KI178 stock to 200 μM with HDAC8 Assay Buffer (Prod. No. BML-KI311). Warm to assay temperature before use. (Note that freezing/thawing of FLUOR DE LYS® Substrate (Prod. No. BML-KI104) solutions in Assay Buffer may cause precipitation of the Substrate). NOTE: The choice of developer is dependent on the substrate used. FLUOR DE LYS® Developer (BML-KI105)* should be used in conjunction with FLUOR DE LYS®Substrate (Prod. No. BML-KI104), and FLUOR DE LYS® Developer II (Prod. No. BML-KI176)* should be used in conjunction with FLUOR DE LYS®-HDAC8 (Prod. No. BML-KI178)*. Note that dilution of either Developer (Prod. No. BML-KI105) or Developer II (Prod. No. BML-KI176) is done in HDAC Assay Buffer (Prod. No. BML-KI143) rather than in HDAC8 Assay Buffer (Prod. No. BML-KI311; contains added PEG and BSA). First, dilute FLUOR DE LYS® Developer (Prod. No. BML-KI105)* 20x stock solution to 1x (e.g. 50 μl plus 950 μl Assay Buffer) in cold HDAC Assay Buffer (Prod. No. BML-KI143; 50 mM Tris/Cl, pH 8.0, 137 mM NaCl, 2.7 mM KCl, 1 mM MgCl2) OR dilute FLUOR DE LYS® Developer II (Prod. No. BML-KI176)* 5x stock solution to 1x (e.g. 200 μl plus 800 μl Assay Buffer) in cold Assay Buffer (Prod. No. BML-KI143)*. Second, dilute the 0.2 mM Trichostatin A (Prod. No. BML-GR309-9090) 100-fold in the 1x Developer just prepared (e.g. 10 μl in 1 ml; final Trichostatin A concentration in the 1x Developer = 2 μM; final concentration after addition to HDAC/Substrate reaction = 1 μM). Store diluted Developer on ice until use. FLUOR DE LYS® Deacetylated Standard (Prod. No. BML-KI142)*: Dilute the 10 mM stock in DMSO to 1 μM with HDAC8 Assay Buffer. Set up four reactions : 60 min rxn; 60 min rxn with Trichostatin A; 0 min rxn; and a standard. Add 23-24 μl of HDAC8 Assay buffer (25 μl minus the volume of enzyme to be added, see step 3) to the 60 min rxn well and the 0 min rxn well. To the third well (Trichostatin control) add 20 μl of 5 μM Trichostatin A . Allow to equilibrate to assay temperature (37°C). (Leave Standard well empty until step 7). Add desired amount of HDAC8 (e.g. 1 U in 1-2 μl) to each well (the 0 min, 60 min, and Trichostatin control wells). To start reaction, add 25 μl of substrate (500 μM or 200 μM in assay buffer) to 60 min reaction wells. Final substrate concentration = 250 μM (Prod. No. BML-KI104) OR 100 μM (Prod. No. BML-KI178). Incubate reactions 60 min at 37°C. Add 50 μl of developer to the 60 min reaction wells. For the 0 min reaction well, add and mix in 50 μl of developer, immediately followed by 25 μl of substrate. For the standard, mix 50 μl of 1 μM standard with 50 μl of 1x developer to the fourth well. Allow 15-20 min for signal to develop and then read plate in a microplate-reading fluorimeter capable of excitation at a wavelength in the range of 350-380 and detection of emitted light in the range of 440-460 nm. Data analysis: Determine the ΔAFU (Arbitrary Fluorescence Units) for the 60 min rxn (AFU of 60 min rxn minus AFU of 0 min rxn). Determine AFU/pmol by dividing the Deacetylated standard reading (AFU) by 50 pmol. Calculate pmol of substrate deacetylated in 60 min (divide ΔAFU by AFU/pmol). SDS-PAGE Analysis: 1. MWM, 2. 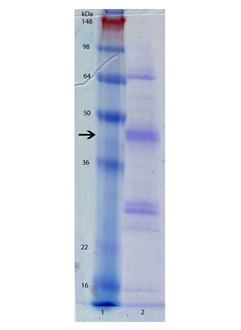 2µg HDAC8 (human), (recombinant) (His-tag) (Prod. No. SE145).